Google Chrome is definitely the first name that pops in our mind when we talk about browsers. Since the release of Chrome, it has always proven to be the best in the market with its mind-blowing design, high-speed browsing, and stupefying features. However, some of the users are open to experiment with other available options and some even have specific demands and requirements which Chrome may not be able to fulfill. If you’re one of them, you can surely give a shot to Chrome alternatives. 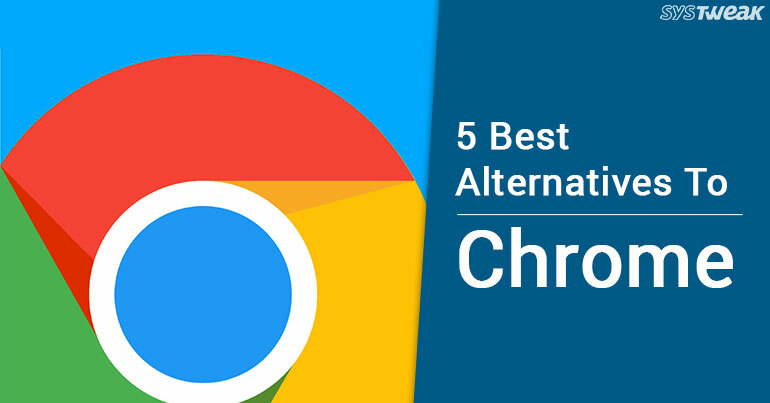 In this post, we’re going to list the 5 best alternatives to Google Chrome to enrich their browsing experience. So, let’s take a look at them! Compatibility: Windows, Mac, and Android. Firefox is a smart browser that gives you a great private browsing experience along with the tracking protection. It is a lightweight browser that consumes almost thirty percent less memory than Google Chrome. Moreover, you can rely on Firefox browser to get 2 times faster results than any other browser. Undoubtedly, Mozilla Firefox deserves to be first on the list. Microsoft Edge is a fast, safe and default web browser on Windows 10 that is replacing Internet Explorer as the default web browser on its shelves. The browser is designed to give you comfort and helps you to focus on the content. Microsoft Edge comes with an inherent personal assistant feature that helps you to search any information while working on any other website. It lets you manage your frequently visited sites in one place. In fact, you can use the hub for the quick visit to recent downloads and history. Compatibility: Windows, Android, Mac, and Symbian. Opera browser is one of the oldest browser that always comes up with interesting and innovative features and never lets anyone steal its throne. It lets you privately browse your content in an incognito tab without leaving a trace on your device. This web browser also has speed dial layout option that lets you access your recently visited websites in a grid format, which can be effortlessly customizable according to your preferences. Like Google Chrome, Opera also comes with inbuilt ad blocker facility that quickly loads the search results faster without any interruption. Compatibility: Windows, Android, Mac, iOS, and Linux. With over billions of active users, Maxthon made a room for best Chrome alternatives. It is a freeware web browser that is available in 53 different languages. The browser shares its compatibility with almost all the extensions and add-ons in Chrome store. Apart from being a swift and user-friendly web browser, Maxthon has a lot more to offer you. You can download videos, music, photos with a tap of your finger on the web and view them offline when you’ve time for them. Indeed, Maxthon is fully loaded with incredible features and deserves a cookie. Pale Moon is another one of the best alternatives to Chrome. It’s a great browser that has a fully customizable interface. It is an open source browser, which is the Goanna-based web browser and developed by M.C. Straver back in the year 2009. As Pale Moon is a multilingual browser that offers a different set of features to make sure you get the most out of your browser. It is worth to give a try. Don’t you think? So, these are the 5 best alternatives to Google Chrome you can rely on. However, you can also check out the other browsers such as QupZilla, Comodo IceDragon and more.